People of every age can benefit from orthodontic solutions that provide them with straighter teeth and an even more beautiful smile. At The Paddington Dental Surgery, we cater to the alignment needs of children, teenagers and adults. Whether you’re looking for traditional braces, a more discreet straightening method (such as Invisalign), or if your child simply needs more space for growing permanent teeth, our experienced cosmetic dentist, Dr. Natalie Dumer, will recommend the best course of action to reach your goals. Orthodontics is the dental specialty that focuses on the science of tooth movement. In orthodontic treatment, alignment and occlusion (bite) irregularities are corrected to improve the function of the teeth and jaws. This can be achieved using a wide array of techniques, and traditional metal braces are, perhaps, the most well-known of them. 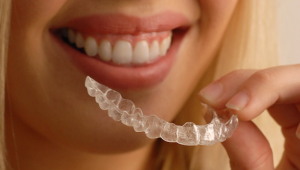 Invisalign, an innovative teeth-straightening method, allows patients to address many common orthodontic concerns with greater comfort than ever before. We can help you determine if this or another approach is right for your needs and goals. By addressing misaligned teeth at an early age, you can help prevent the need for extensive work in the future. A common problem in young patients is the lack of space for their new adult teeth. With early evaluation, our dental team can create a treatment plan that will make it possible for more space to develop between the teeth and reduce the potential for the teeth to crowd each other as they come in. This can be very effective for reducing and even eliminating the need for future surgical extraction or major orthodontic treatment later in life. With early treatment as your child’s teeth are developing, we are able to catch and treat a number of potentially serious orthodontic issues before they become permanent. Make sure to schedule routine orthodontic checkups for your child to prevent and treat alignment issues, bite issues or other concerns. Treating alignment problems now may mean fewer or less complicated concerns later on. Early orthodontic treatment is designed to correct or minimise developing misalignment or malocclusion (which literally means “bad bite”). When the arches or jaws are not in the optimal position, children can experience problems speaking or eating, have jaw and other body pain, or wear down their teeth—leading to damage and decay. Early treatment and two-phase treatment can limit these issues in certain patients. That said, early orthodontics is not appropriate for every case, and we can evaluate your child’s needs to determine if an early intervention is necessary. As an adult, you can still attain straighter teeth without having to worry about wearing noticeable metal braces. In this day and age, there are several advancements in the orthodontic field to provide a discreet, yet effective solution for crooked teeth, misalignments and bite issues. If you would like to straighten your teeth but have been reluctant to do so based on the bold appearance of traditional braces, consider our alternatives such as Invisalign. Our Sydney cosmetic dentists have extensive training in orthodontics and can often complete comprehensive orthodontic treatment right here under one roof. Please visit our practice to learn which treatments may work best for you. Through the virtually invisible technology of Invisalign, you can achieve a straighter smile without anyone suspecting you are undergoing treatment. Invisalign clear teeth aligners are custom-designed to help you gradually straighten your teeth with no wires or brackets involved. They are removable for eating, drinking, brushing, and flossing. They are known to be much more comfortable alternatives for people who have mild, moderate and even severe teeth misalignment issues. From a short dental evaluation, you’ll find out which orthodontic methods will work best in your journey to achieving straighter teeth. For more information about our child or adult orthodontic options, or if you’d like to make an appointment, please contact us today.